Highway 38 is currently closed at Bryant Rd. in the Mentone area due to the Mill Fire. Smoke is visible and can be smelled here in Big Bear but there is no threat to the Valley at this time. Please use either highway 330 through San Bernardino/Highland or highway 18 through Lucerne Valley if you are coming up to Big Bear tonight. We will post any updates as they become available. Highway 38 through Redlands to Big Bear is now open with no detours. It appears that fire crews are gaining ground on this fire. Will update if there are any more changes. Here are a few fun facts about fireworks. RS Vacations wants to remind you that other than the professional show over the lake, ABSOLUTELY NO fireworks are allowed in Big Bear due to extremely high fire danger. Please don’t risk the loss of our homes! Thank you!! Fireworks have been around since the days of ancient China. But their history in the United States is far-reaching, too. Right after the Declaration of Independence was approved by Congress, John Adams, in 1776, wrote to his wife that America’s independence “ought to be solemnized with pomp and parade, with shows, games, sports, guns, bells, bonfires and illuminations, from one end of this continent to the other, from this time forward forever more.” Illuminations, of course, meant fireworks. The only catch was that Adams was two days off on his recommendations of when Independence Day would be celebrated. He predicted a holiday date of July 2, the day a closed session of Congress approved the resolution of independence. Instead, the country went with July 4, the date on the Declaration of Independence. Ever wondered why some fireworks are blue and others are red? It’s all in the chemicals. Copper produces blue sparks, while a mix of salts and other substances make red. Barium yields a green glow, and sodium burns yellow. Americans’ love their fireworks, but the biggest display ever took place in Portugal in December 2006. In 37 launch sites spread across the island of Madeira pyrotechnics experts set off no less than 66,326 individual fireworks. In fact, Madeira snagged a Guinness World Record for the largest fireworks display in the world that year. As much fun as they are, fireworks are, well, kind of dangerous. In July 2010, the U.S. Consumer Product Safety Commission recorded at least 6,300 fireworks-related injuries. About 1,200 were caused by handheld sparklers, while 400 were the fault of bottle rockets. Hands and fingers were most frequently injured. Just as you see a flash of lightning before you hear the thunder, you’ll notice fireworks lighting up the sky before you hear their echoing booms. That’s because light travels about a million times faster than sound. Use this knowledge to your advantage to calculate how far you are from the explosions: As soon as you see a flash, count the seconds until the “boom.” Divide by three to get the distance between you and the patriotic pyrotechnics in kilometers. Have you seen the weather forecast for the western United States? Holy cow, it’s going to be hot! I’ll bet it will be much cooler here at 6700′ than it is at your house though! 😉 Temps are expected to be hovering around the 90° mark this weekend, but cooling slightly over the next week. 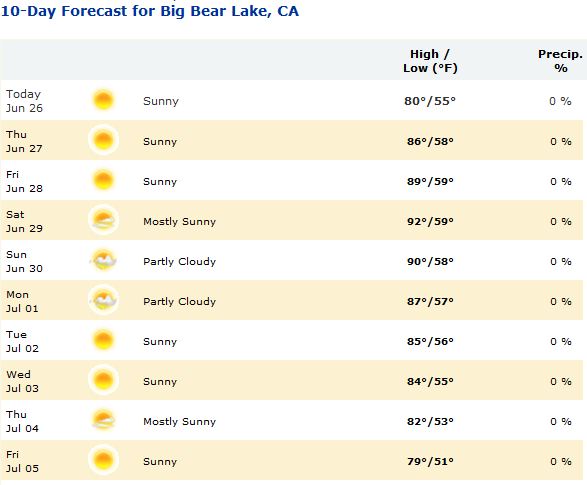 Weather like this makes playing in Big Bear Lake a must. What better way to cool off than to participate in the Big Bear Paddlefest going on June 29th? Check out my previous post on it here for more info. As always, you can rent boats, wave runners, canoes, kayaks, SUP’s and more from several local marinas. Want to stay indoors to beat the heat? Check out a fabulous tribute band at The Cave or watch Okalahoma! on stage at the PAC. You can also check out the corvettes at the Corvettes West annual show. 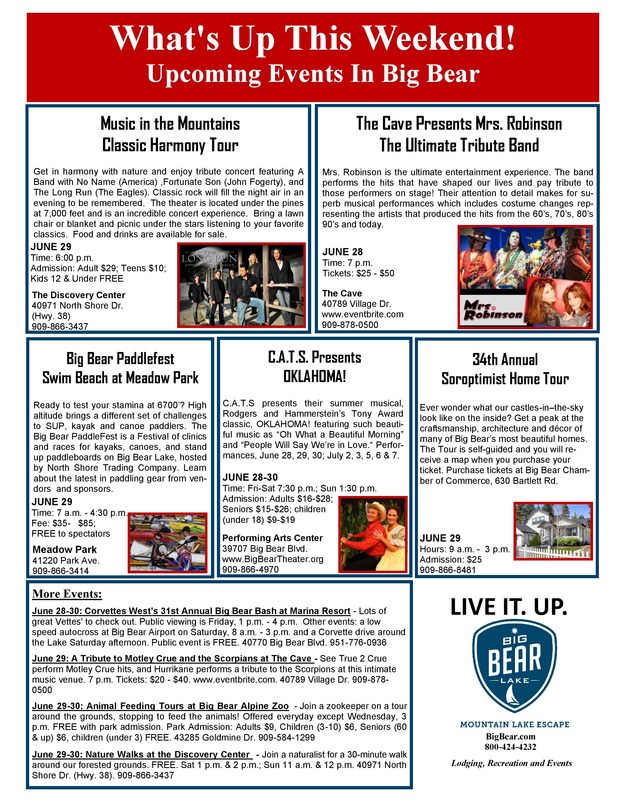 Tons of fun is to be had all over Big Bear this weekend! RS Vacations has some great last-minute deals and activity packages. Check out the new pages right here on this blog (see the tabs at the top of the page) or go to RSVacations.net to check it out and book a Big Bear Cabin today! Wild Wednesday: Spectacular Deals (and weather!) for the 4th! Uh Oh! Did you just realize that July 4th is only a week away and you haven’t booked a cabin yet? Did you look at the 10-day forecast for your city and groan at the 100° + temperatures you see for the holiday weekend? Have you been wanting to visit Big Bear Lake in the summer, but don’t want to break the bank? You are in luck, my friend! RS Vacations and Big Bear Lake are the solutions to all of the above problems! All of our cabins can be securely booked online at www.RSVacations.net. We have some truly amazing last-minute deals that are too good to pass up! Check us out and book today!! Solution #1 – We have several cabins still available for the 4th of July weekend. Solution #2 – Perfect summer weather for fun! June 30 to July 8, 2013 Stay 3 nights and get the 4th night FREE and celebrate the 4th with us in cooler mountain weather. Savor all the summer activities Big Bear has to offer and enjoy a good old fashioned 4th and Big Bear’s SPECTACULAR fireworks show over the lake. Discount automatically applies with Online Booking or call us today and we will help you with the booking process. NOTE: Discount can NOT apply to existing reservations. This offer can NOT be combined with other RS Vacations booking discounts. Minimum stay of 4 nights required. Come on up and enjoy the 4th at 7000′! In Big Bear, the 4th of July is so much more than just a (spectacular!) Fireworks show. We have activities and events to satisfy everyone in your family or group. Whether you’re looking for thrills, relaxation, shopping, entertainment, or just getting in touch with nature – we have it all…and then some! RS Vacations still has a few homes left and do we have a deal for you! Visit us today and book your Big Bear Cabin before they’re all gone! June 30 to July 8, 2013 – Stay 3 nights and get the 4th night FREE and celebrate the 4th with us in cooler mountain weather. Savor all the summer activities Big Bear has to offer and enjoy a good old fashioned 4th and Big Bear’s SPECTACULAR fireworks show over the lake. Hear some great, live music: Rock out to some amazing tribute bands at The Cave in the Village. Listen to the hits of Bruce Springsteen, Tom Petty, ZZ Top and more! Check out some local musical talent at the Skeleton Key or one of our local bars/clubs. Take in some Art: The 8th Annual Village Art Walk features 40+ artists, food, live music and more. Experience an Old Time Bear Country Fair: Face painting, jewelry making, bear roaring contest and more! Which of our resident bears can eat a pie fastest? Visit the Big Bear Alpine Zoo and find out! Check out some great Crafts: Visit the 27th Annual Big Bear Lake Independence Day Festival and Craft Show. Food, music, and activities as well. At the Convention Center. Get out on Big Bear Lake: Rent a boat, kayak, canoe, wave runner, paddleboard or peddleboat from a local marina. Take a cruise on a pirate ship or an authentic paddleboat. Kick back at Swim Beach and play on the giant lake slide. See the lake from above while parasailing. Get into the National Forest: Take a hike, a 4×4 Jeep tour, a horseback ride, ride a zipline or ride the sky chair and mountain bike down. Wander through the Village: It may be under construction, but the Village of Big Bear Lake IS OPEN! Browse quaint shops, sample some amazing fudge (YUM! ), watch a live cooking demonstration or have an outstanding meal in one of the restaurants. Have some family fun: Zoom down the Alpine Slide, splash down the Waterslide, take a unique segway tour, go ice skating, play Laser-Tag, go bowling, visit the Zoo, or rent some bikes and ride the Alpine Pedal Path. Relax: Get a massage, get a mani-pedi, sit out on the deck or in the spa of your RS Vacations Cabin and listen to the breeze and the birds. Watch that amazing Fireworks Show: No matter where you choose to view it, you wont be disappointed! Please join us in beautiful Big Bear Lake this Independence Day weekend and make some lasting memories with the people you love! See you soon!! I have lived in Big Bear since June of 1977. In the ensuing 36 years, I have viewed the annual 4th of July Fireworks Spectacular many times and from many different perspectives. Let me tell you, it has improved greatly over the years! Back in the late 70’s, we had a year that we could actually count the total number of fireworks. I think it was 12 or something close to that. 😦 Last year was probably the best show I’ve seen, with the presentation lasting over 30 minutes. I have heard that this year’s show will be just as amazing!! I was thinking back today about all the different locations that I have viewed the fireworks from over the years. It is a fairly long and varied list! From Meadow Park (swim beach area) – This was our go-to spot when I was a kid. We would have frisbees and squirt guns to keep us occupied until the show started. Sitting on a friend’s dock – Some friend’s of my parents invited us over to watch from their dock one year. *One of our homes, FeatherNest, is on the lake w/ a private dock and is still available for the 4th!! From a boat on the lake – My grandparents took us out on their boat. Talk about rush hour traffic!! We didn’t get home until almost midnight! But an experience that everyone should try to have at least once! Spectacular! From our Land Cruiser while 4x4ing in Lightning Meadows (in the forest above the village) – We decided to beat the crowds and see them from afar. A neat perspective! From the 2nd story deck of a friend’s house – It’s good to have friends! A great view without having to fight the traffic! *Another of our homes, Eden Mountain Lodge, has a wonderful view from the back deck and is also still available for the 4th! Sitting among waist-high weeds (and a lot of bugs!) on the north shore of the lake – We decided to see the show last-minute and this was the only spot available….Just thinking about it makes me itch! From the Alpine Pedal Path – Last year my sister parked her RV in a turnout on the north shore the night before the 4th. The next day, we joined her and spent the whole day there riding bikes and playing games, then had an absolute perfect view for the show. One of the best years ever! From the top of Miracle Mile at Snow Summit – Several years ago, my brother (who worked at Summit) took our family up to the top of the slopes where we set up chairs and watched the show. It was amazing! We could barely hear the booms, but the view was breathtaking. My favorite perspective. There may have been others, but those are the most memorable. Every time I see the show, I am so glad I did. The United States of America may not be perfect, but we do enjoy so many freedoms that others do not and we are a feisty bunch! Watching the show with some patriotic music in the background reminds me how lucky I am to be an American!! 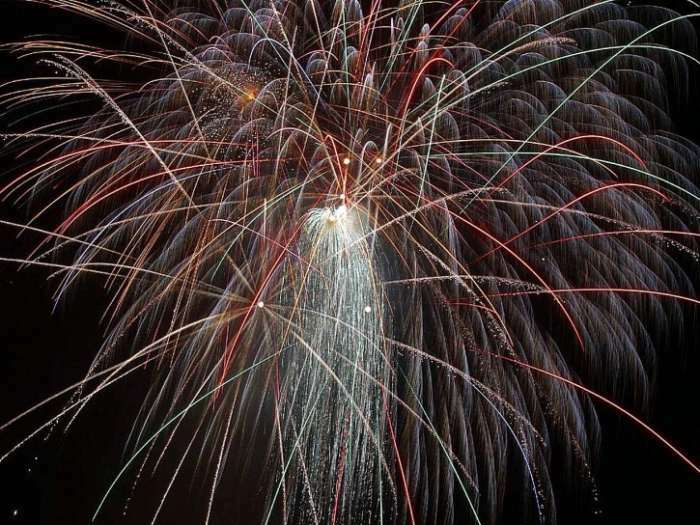 Where is your favorite place to view Big Bear’s Fireworks Show? Come to FeatherNest and enjoy the tranquility of Big Bear Lake’s North Shore. *Watch the 4th of July Fireworks Show from your own private dock or from the convenience of the upper deck. FeatherNest on the Lake is a charming 1 Bedroom, 1 Bath, 750 sq. ft. cabin that sleeps 3, sits directly across the street from Big Bear Lake and boasts a fantastic 180-degree view and private dock. This home is designed to be the ultimate escape from stress! Unplug from gadgets and connect with each other and nature. You will not find a TV, phone or internet here (though your cell phone will work just fine!). What you will find is serenity; in the sounds of the waves lapping the shore, in the sight of waterfowl in flight, and in the amazing views of the lake and surrounding mountains and forest. Pure Heaven! As you enter this newly updated cabin, you will be welcomed by the fun lake decor, beautiful pine ceilings and large windows that let you enjoy the view. There is a cozy fireplace in the Living Room, a comfy chair and a sleeper sofa. A second seating area is located under the windows so you can relax and read that bestseller or just admire the view. The fully equipped Galley Kitchen is the perfect place to prepare a meal after a day of lake fun. You will have everything you need here at FeatherNest. Enjoy that meal or your morning coffee at the dining table that faces the lake view, or take it outside on the fabulous second story deck and take in the sights and sounds of nature on the lake. When it is time to settle in for the night, you will enjoy the luxurious queen bed and rustic ceiling fan in the woodsy Bedroom. A Full Bath is nearby for your convenience. Ready for some lake fun? FeatherNest boasts its own private dock directly across the street. Do some fishing, birdwatching or rent a boat from a local marina and have it conveniently parked and ready to go when you are! Have your own boat? Launch it at the nearby boat launch and you’re all set! If you want to take in some nature, the National Forest is directly behind FeatherNest and there are several designated trails nearby. Book FeatherNest on the Lake today and get ready to relax and unwind – the Big Bear way! View more photos, check availability and book FeatherNest on the Lake online at RSVacations.net today and treat yourself to an amazing Big Bear Lake Vacation.